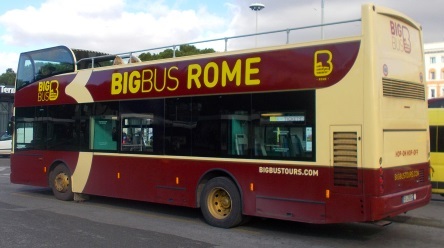 There are a large number of companies in Rome that offer sightseeing tours by bus. The many offers are quite confusing for the tourists. Holidaymakers in Rome are often approached on the streets by people who sell more or less sensible tickets for such bus tours. We recommend to buy tickets before the trip to Italy on the Internet. This page of our Rome travel guide presents the best offer from our point of view in detail. In Rome, so-called „Hop on Hop off“ city tours have established. The buses of different competing providers run regularly (for example every 20 minutes in 2019) on the same route. There are, for example, 8 stops in a circuit at the main sights (Colosseum, Vatican, etc.). You buy a ticket for one or more days. You can get off where and for how long you want and then continue with another bus from the same company. Several rounds with one ticket are also possible. In the bus, you are usually informed via headphones adjustable in different languages (also English) about the following sight. Advantages: You can set your own priorities. You can get out where you want and stay as long as you want at any sight. You don’t have to travel to the sights yourself by bus or subway. This is not always easy in Rome. Especially the bus network is very confusing for tourists. Disadvantages: You can’t get anywhere. The organizer sets the goals. But that is probably the case with every round trip or city tour. Of course such bus tours also cost money. Those who buy a day ticket for public transport will get away cheaper. Therefore, you have to deal with the public transport in Rome that is complicated for tourists, including often completely overcrowded subways, buses, delays and pickpockets. The exact current prices of Big Bus Rome can be found by clicking on the link in the yellow box below. Which Hop on Hop off provider should I choose? At first glance, the offerings of the large providers are relatively similar. Almost all of the city tours providers in Rome have the double-decker buses, the upper floor of which is open (see picture, take sunscreen with you). All bus companies go to the big sights. Due to lack of space they are not allowed to stop directly in the Vatican, but in about 10 to 15 minutes walking distance. The Hop-on-Hop-Off buses offer information via headphones in English, among other languages. The buses are not always punctual, which is no wonder with the traffic in Rome. The problems are in the details: examples are overcrowded buses, bus cancellations, too much time distance between buses (waiting), unfriendly staff, too little information, false promises and so on. When it comes to ratings on the Internet on various websites, the company „Big Bus“ scores best. We have also had good experiences with the dark red double-decker buses. 1. at 4 important stops there are additional free guided tours on foot. For a few Euro more you can book another round trip to other destinations including catacombs (very interesting). Bookings on the Internet on this english language website are about 10% cheaper than on the spot. You can get on with the Internet-Ticket at any bus stop, you don’t have to go to the main station Stazione Termini. At the main station, Big Bus stops almost directly in front of the entrance, which is also not the case with some other providers. We were especially impressed by the nice and committed employees of Big Bus. – From the stop at Barberini Square you can also easily reach the world-famous Villa Borghese Park with the famous Borghese Art Museum Gallery. – From the Colosseum it is not far to the huge excavation site around the Forum Romanum. – From the bus stop of Big Bus at Circus Maximus we also went briefly to the interesting church Basilica Santa Maria in Cosmedin. – Near the Big Bus Fontana di Trevi stop, you can reach the Trevi Fountain, the Quirinal Palace and the Spanish Steps on foot. So you get to almost all the top sights in Rome including the Vatican.